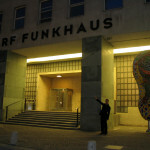 In 2006 Orf Kunstradio invited Timothy Didymus to a week long residency at the Funkhaus, Vienna. 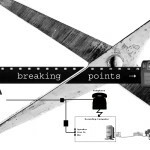 Out of this time we developed Breaking Points, a live radio performance broadcast in 5.1 surround sound. The technique of jump cutting inadvertently developed from early cine film snapping during projection, requiring repairs often made in haste, before the film was sent onto the next theatre engagement. As an indirect consequence of the running repairs subsequent screenings resulted in missing frames, causing small jumps in the timeline. 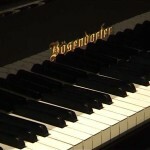 Cineastes from Einstein, Dziga Vertov to Jean-luc Godard all employed this cinematic technique with fascinating effect. 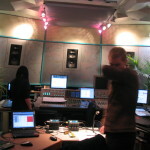 At the time, with the emergence of more powerful audio DSP (digital signal processing) we began applying the jumbling of time to live situations, cutting a real time audio signal into pieces, then stitching it back together (but not in the same order) using multiple arrays of delay lines. We also used close and distant microphone placements to add spatial depth to the instruments, jumping between near and far, and a live radio ‘phone-in’ inviting public comment.